Jaelyn Mason makes a save for Washington during a Division II Sectional tournament match at Circleville Tuesday, Oct. 18, 2016. Also pictured for Washington are (l-r); Kayla Kimmet, Mackenzie Shaffer and Carly Dodds. 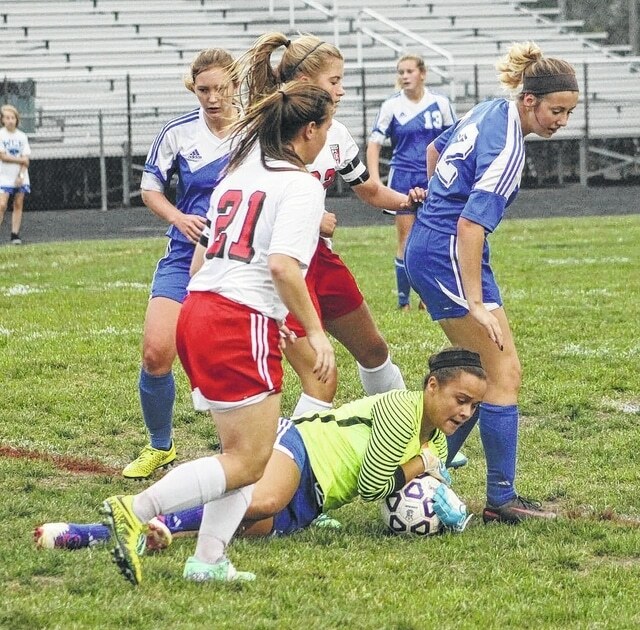 CIRCLEVILLE — Circleville peppered the back of the net with regularity on Tuesday, Oct. 18, scoring five goals in the opening 10 minutes of a Division II Southeast District semifinal match en route to a 15-0 win over visiting Washington Court House. “I thought our girls played well and were focused,” CHS coach Evan Callihan said. “That was our main focus this week. We wanted to make sure we were focused on the task at hand. Avery DeLong scored the first of her five goals when she took a pass from Morgan Bircher, dribbled and scored past the keeper with two minutes off the clock. Bryce DeLong and Avery DeLong both scored unassisted goals to push the lead to 3-0 with less than seven minutes off the clock. Avery DeLong then sent a pass into the box for Bircher, who scored the first of her five goals to increase the advantage to 4-0. Bircher was on the giving end of the next goal, passing to Avery DeLong, who dribbled down the field and completed her hat trick with 30:51 remaining in the first half. Bircher made it 6-0 when she dribbled into the box and scored past the keeper with 28:26 remaining in the first. The Tigers went over seven minutes without scoring until Sarah Moats sent in a pass to Bircher, who dribbled down the left side of the field and into the box to complete her hat trick, increasing the CHS lead to 7-0. Bircher then went around two defenders to score less than a minute later to make it 8-0. Avery DeLong showed off a nifty spin move past a Washington Court House defender to get an open shot, which she converted to make it 9-0 with 19:16 left in the first half. She then fed twin sister Bryce for the final tally of the first half, putting the Tigers ahead 10-0 at intermission. Galloway scored two goals in the second half for the Tigers, while Sarah Taylor, Avery DeLong and Bircher added a goal each. Katie McIlroy made three saves for the Tigers, while Jaelyn Mason had 20 for the Blue Lions (0-18). The Tigers (11-4-2) host third-seeded Unioto on Saturday at 2 p.m. in a sectional final. The Shermans defeated the Tigers 4-0 in last year’s sectional final.